Colour permeates every single activity in an Indian’s life, more so in our villages. In Kutch, Gujarat, colour pervades not just the gorgeous clothes of the Kutchi people but even the small, nondescript items of everyday use.Spoons and ladles, chakla – belan (board and rolling pin), toys, stools, dandiya sticks, everything is covered with psychedelic patterns and merging zig zags of contrasting colours. Most of the process of making lacquer-ware is done on a manual lathe.Babool wood, which is found locally, is mostly used for the products. 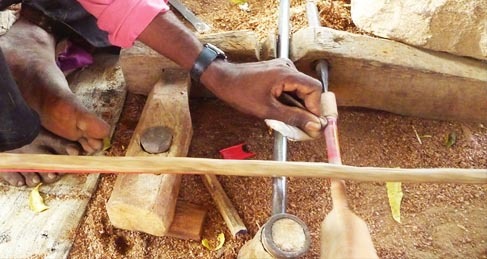 Once the wood is cut into basic forms, each piece is individually put on the lathe and smoothened using wooden tools. The lathe is manually powered using a stick and rope arrangement. A rope is wound around the object to be worked on and is pulled with the help of a stick attached to it. This generates a rotating motion on the object, which can then be manipulated further. The colour is made from stones found in the surroundings and lacquer bought from local markets. Then this compound of colour and lacquer is pressed against the fast rotating object on the lathe, the lacquer melts with the heat generated due to friction and sticks to the surface of the wood,thus imparting colour. Following that, metal and wooden tools, which are improvised by the craftsmen themselves, are used to smoothen the coating. Finally, the piece is given a glossy polish with oil. 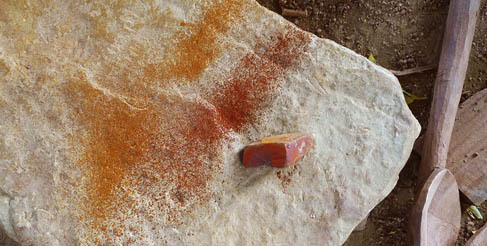 Lacquer ware of Kutch has a characteristic zig zag pattern of mixing colours. This interesting effect is achieved by first transferring stripes of colour from an unpolished lacquered stick and then pushing the colours into each other on the lathe. This creates the peculiar kaleidoscopic design with vivid motley colours. The craftsmen are believed to be practicing lacquer lathe work for seven generations now. The whole family is involved in this craft, with men doing the heavy work of cutting and shaping of the wooden articles and women applying finishing touches to them. 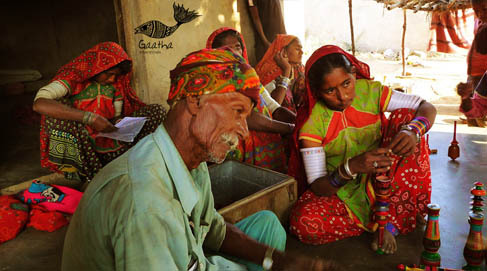 According to craftsman Vaghavalabhai Khamiya of Nirona, Kutch, the name of the village Nirona came from “Niro-Vadha”, Niro meaning place and Vadha meaning one who cuts wood. Lacquer work is the main profession of this semi nomadic community of Vadhs. They work using simple tools, even the lathe is portable, and they do not use any electricity in the process.Working under a tree in the day time, chatting with family members, with so much simplicity they create wonderful objects, spicing up our everyday chores. Do these artisans even got recognized for all they are doing? 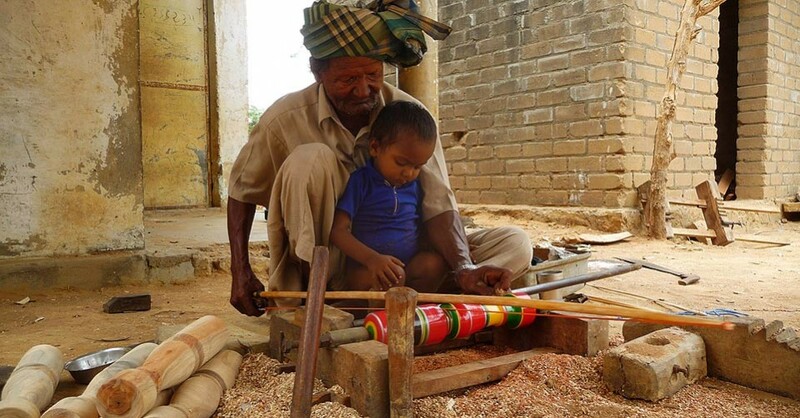 Indian handicrafts are way too rich, but people should respect the creators of it.